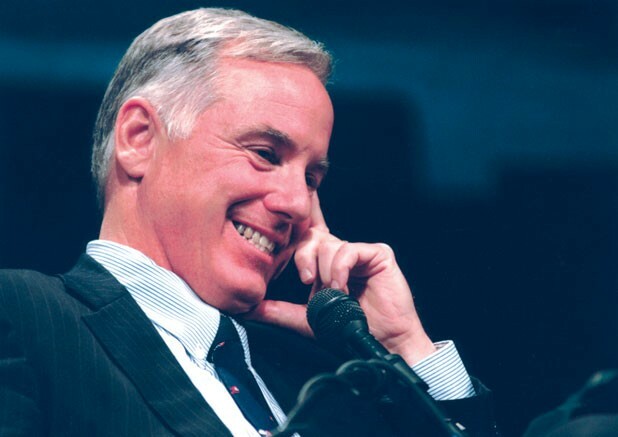 Howard Dean is a former six-term Vermont governor, presidential candidate and chairman of the Democratic National Committee. He’s also the founder of Democracy for America, a grassroots activist organization. Through it all, he’s been Dr. Dean. A practicing physician before getting into politics, he brings credible knowledge of health care and the insurance industry — and, for that matter, politics — to his media appearances, his public talks and his new book, aptly titled Howard Dean’s Prescription for Real Healthcare Reform. Published by Vermont’s Chelsea Green, the 144-page paperback announces its mission in a wordy subtitle: How We Can Achieve Affordable Medical Care for Every American and Make Our Jobs Safer. Will the volume end up on the nightstand of the country’s First Reader, Barack Obama? Time will tell. But it wouldn’t be a surprise, as reforming health care — or finding a way to pay for it, at least — is one of the central goals of his presidency. Just this week, Pres. Obama faced down a tough audience on the subject: the American Medical Association. While the individual health insurance market leaves many families without coverage or bankrupt, the great majority of Americans receive fairly comprehensive health coverage from their employer. In fact, despite the rapidly increasing cost to their employers, they are generally satisfied with these plans. Many, in fact, have been so satisfied that — until now, with millions losing their jobs — they have rarely stopped to consider what might happen to them if they lost the security blanket of employer-based coverage. Unlike the individual health insurance market, where every person is subject to an underwriting process during which the insurer estimates the possible expenses of providing coverage, employer-based plans spread the costs of insurance across a large pool of workers. Everyone pays the same premium, and nobody can be excluded from coverage because of a preexisting condition. Healthy members subsidize coverage for the sick, and everyone can rely on coverage should they fall ill. But the employer market — where 160 million Americans obtain their health insurance — boasts plenty of problems as well. Since 1998, premiums for employer-sponsored coverage have increased 119 percent. Nearly 9 million workers employed by larger firms (those with 100 or more workers) were uninsured in 2007. The lagging job market and the economic downturn have had the effect of pushing a growing number of Americans into the ranks of the uninsured. According to a recent report from the Center for American Progress, in March 2009 alone almost 11,000 workers a day lost their health insurance. Nationally, the percentage of Americans “under the age of 65 with employer-sponsored insurance declined to less than 63 percent in 2007, from more than 67 percent in 1999,” and employers are now reporting that they plan to shift more health costs to their employees. Those who are sick have the hardest time finding affordable coverage. Dozens of health conditions — from cancer to diabetes to pregnancy — can render an applicant “uninsurable,” and some Americans are unable to buy individual coverage if they have a history of health problems. As Karen Pollitz, research professor at Georgetown’s Health Policy Institute, often observes, even minor health conditions, such as hay fever or acne, can trigger a denial by some insurers. In most states, insurers can refuse to sell individuals policies because of applicants’ health, recreational activities, occupation, and even credit history. Only five states prohibit every insurance company from excluding all but the healthiest consumers. One of these, I’m proud to say, is Vermont, which adopted guaranteed issue (meaning no one may be turned down or rejected) in 1991. Most states pose no limits on how much insurers can increase premiums based on an individual’s health status. Many allow private insurers to exclude coverage for preexisting conditions for more than one year and revoke an individual’s health insurance policy without advance review by the state. Healthcare plans in the individual market attract younger, healthier applicants by pairing high deductibles with low premiums. These plans may work for individuals with limited health expenditures, but they don’t protect consumers from catastrophic health events. Most applicants are unaware of the limitations until it’s too late. The Clausens are still accruing tremendous medical debt — debt they will be paying off for the rest of their lives. Their one hope is that Gary, having turned sixty-five, now qualifies for Medicare, a guaranteed public health insurance program, which does not have the shortcomings of the private healthcare plan they purchased. If Gary had been five years younger and Medicare not an option for him, they would certainly have lost their house and everything else they own. A real healthcare reform package, which includes a public health insurance option, would give people younger than the Clausens a real safety net. They wouldn’t have to wait until they are sixty-five to get decent healthcare coverage. In the individual health insurance market, policies often include abstruse clauses and incomprehensible language that make it very difficult for consumers to figure out what is covered. Choice is minimal. These policies usually have high deductibles. They also tend to have monthly, yearly, or lifetime caps on coverage. These features do make a consumer’s monthly premium lower. But policies with low caps can be particularly problematic: They don’t protect consumers against catastrophic loss because of their limited expenditures. For instance, policies with a $100,000 maximum lifetime benefit are common. Many plans — for example, Aetna’s Affordable Health Choice (as cited by Consumer Reports) — are limited to part-time or hourly workers. Consumer Reports cited one plan that covers only $1000 in hospital costs and $2000 of outpatient expenses annually. Clearly, any serious illness is not covered by such a plan. The AARP, which is a trusted name for many seniors, makes money from insurance companies by recommending policies to its members. The organization actually does little screening of these policies, and — as in the Clausens’ case — people who buy these policies are often left with products that are inappropriate for them. Consumer Reports also interviewed Jim Stacey of Fayetteville, North Carolina, who bought a policy from Midwest National Life Insurance in Tennessee. “The policy listed benefits including a lifetime maximum payout of up to one million dollars per person.” But after Stacey had a bout with prostate cancer, the company paid less than 10 percent of the cost of the treatment. Howard Dean’s Prescription for Real Healthcare Reform: How We Can Achieve Affordable Medical Care for Every American and Make Our Jobs Safer, Chelsea Green Publishing, 114 pages. $12.95. Click here to watch Gov. Dean, M.D., make his case on ChelseaGreenTV. Gov. Dean will speak at DemocracyFest on July 19, Sheraton Burlington, at 9 a.m.